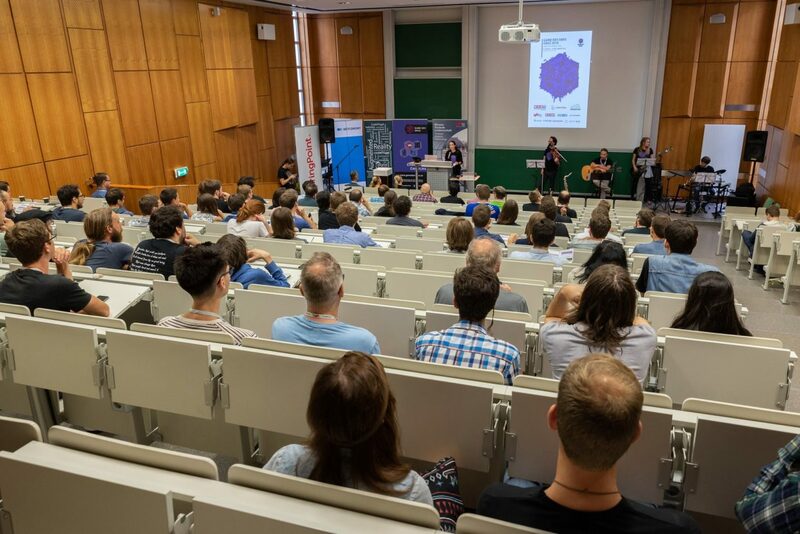 Recently the GameDev Days 2018 took place in Graz (and me being one of the hardworking board members making it possible) and all talks and panels of the 3-day conference were livestreamed via Twitch to an international audience. Definitely consider livestreaming the next time you’re hosting an event, talk, presentation or panel, it usually pays off and is not too hard a thing to do either, as this blog will show you. The livestreams were also for local people who couldn’t attend and were also streamed to the other rooms of the venue where game exhibitions or socializing took place. This considerably increased the reach and relevance of the event for a lot of people, additionally the recordings resulting from the livestream can be used afterwards as an additional marketing tool. There’s a bit of preparation involved, mainly getting the necessary equipment, deciding on a streaming service, setting everything up and of course to promote the livestream early on! As main and most basic ingredients you might want to get hold of a camera, a microphone for capturing sound and a pc/laptop with a fast internet connection for the best livestreaming experience. Software wise at least a streaming service like Twitch and some streaming software is needed, but more to this later. A camera is of course needed for capturing visuals, although it would also be possible to just capture and stream the sound, podcast style. Since “a picture is worth a thousand words” we’ll go with using a camera though. The most basic requirements for a camera would be to record at least in HD resolution and it should be possible to hook it up to a pc obviously. On the low-budget end every current generation webcam should fulfill that requirements. Webcams like these are actually a often used choice for this use case since the resolution is usually downscaled before streaming to the streaming service anyway so higher capture resolutions aren’t always needed. It’s worth though to check the driver or accompanying software of the webcam to be able to control the look of the video. Being totally dependent on auto exposure/contrast/etc. is not the best starting point for high visual quality. Way better image control is possible by using DSLRs or mirrorless cameras, which tick all the requirement boxes but one needs to take into account that those have the risk of overheating and turning off suddenly since most of them weren’t designed for long time recording in the first place! Camcorders on the other hand were designed for exactly this kind of recording and are a valid choice for livestreaming! If you have a lot of budget there’s nearly no upper bound on what one can spend on a fancy camera, renting one like these might be recommended though before spending all that money to buy one. While a simple usb-based recording device might do the job it’s worth investigating fancier options since sound is really crucial for the stream to be enjoyable by a large audience. If you use the sound input (aux-in) or usb port of the laptop is up to you, in our setup we have a dedicated audio interface for capturing and mixing down all the different audio capturing devices we use. Capturing the microphone of the speaker before sending the signal to the venues speaker might be a good idea, having another microphone near the audience for capturing questions or applause is also a common approach. Make sure to either mix them well or downscale to mono when streaming, it’s annoying for viewers to have the speaker on the left ear and the audience on the other ear when viewing with stereo sound, which could easily happen if you don’t pay attention to this. Any Laptop/PC will do as long as it’s not too old. The more processing power the better, you wouldn’t want to introduce lag or frame drops because your device is not powerful enough for the encoding/streaming in high quality. The operating system to use depends on the streaming software and hardware drivers. While the most used streaming applications are available for Windows, MacOS and even Linux it pays off to double check which operating system is required by the drivers of the hardware (camera/microphone/sound interface/etc.) since it’s crucial these work well. And of course make sure to have a good internet connection with high upload speeds. Also make sure the connection is stable without even short hiccups, a wired connection is probably preffered to a wireless connection. Especially at conferences or fairs there is the possibility that there are multiple wifi networks interfering, which is something to avoid happening during livestreaming obviously. There are a lot of different streaming services available nowadays, the biggest and most famous ones being Twitch.tv and youtube live. The decision which one to choose largely depends on the content you’re intending to stream and the intended target audience. While Twitch started as a streaming service for video game streamers it now has official categories for lots of stuff, ranging from game development to cooking shows or talk shows. Youtube livestreaming is pretty general purpose but there are a lot of other services serving niche industries like artists or gamedevs. It’s also entirely possible to directly livestream on Instagram, Facebook or Twitter which has the advantage of reaching a probably already existing userbase for your brand. There’s a lot of different streaming software to choose from, see this list for a non-exhaustive overview. Over the last few years Open Broadcaster Software has been established as one of the most widely used solutions. It’s available on Windows/Linux/MacOS and lets the user control the whole streaming process, from setting up the stream, mixing the different input sources (video, audio, etc.) and arranging them in stream view to even creating a “stream overlay” which is a stream overlay showing the most important infos, logos and more regarding the event/talk/brand. If you’re using a hdmi capture card it’s also possible to directly get the slides of the talks as input and arrange them next to the image of the camera in the livestream which greatly enhances the viewing experience if you’re having a lot of talks at your event. The streaming software can automatically stream to the chosen streaming service like Twitch once configured correctly. OBS even comes with a helper tool which determines the best combination of settings for your streaming setup, taking into account stuff like your device specs, up/download speeds, encoding settings and more. One important point is that the streaming software should enable to also record the stream to a local file on your harddrive. Most streaming services allow to download a recording of the livestream afterwards, but this has the streamed quality and possible some downsampling while the streaming software is able to write to file before encoding and uploading and thus resulting in a higher quality. Once everything is set up you’re ready to livestream your event. Make sure to test beforehand and do a test stream with verifying on another device that everything works! During livestreaming it’s best to constantly check everything is running smoothly. Check with every speaker or panel member beforehand if livestreaming is okay for them! Sometimes it’s necessary to mute or stop the livestream for a short time since it could be possible speakers mention information not meant for anybody except the audience (details about a yet to be announced project for example). Because of this it’s really important to check with everybody beforehand if livestreaming is fine. Most livestreaming services allow interaction with your viewers, usually through a chat or something along those lines. Communicating with your community on this way during the livestream greatly increases the attractiveness of your livestream for viewers. For example it’s a great idea to also read questions from chat during a Q&A session after a presentation, this increases interest in the topic of the speaker and viewers are happy their voice is actually heard and viewer retention is likely much higher, a nice win-win situation. When stopping the stream it’s a good idea to say some final words to the viewers of the livestream, either via stream or chat. Make information about your event and social media channels easily discoverable or post them additionally in chat after the stream end so viewers can stay up to date. Also don’t forget to stop recording and check your local files if everything went well, just to be safe you could download the stream recording provided by Twitch or whatever streaming service you decided on using. You could then take this recording and either start splitting it in relevant parts or just take the whole recording and upload to youtube or vimeo! As you can see, there’s a lot to pay attention to while livestreaming an event but I hope this guide is helpful for overcoming these obstacles. In the end it really pays of and could potentially make your event much better. Have fun!